For most of the noughties, Steve Coogan’s deplorable alter ego was consigned to a dusty attic alcove along with other grainy favourites of the VHS era. Following the success of his first ever assault on the Box Office, Alan Partridge is ‘bouncing back’ once again. With his big screen counterinsurgency ‘heroics’, Norfolk’s most enduring disk jockey made a brief and defiant claim for relevance in the HD banquet of the Digital Age. To all those inflicted with withdrawal symptoms since Alpha Papa, despair not, Alan does not, will not, cannot desert his long-suffering audience. Many of you will be pleasantly surprised to discover that the ‘Partridge Renaissance’ of the twenty-tens is not a mere hit ‘n’ run attack but a multi-pronged invasion of our screens and airwaves , with the 2010 hatching of Alan Partridge’s Mid Morning Matters covertly beginning the operation with twelve 15 minute webisodes. 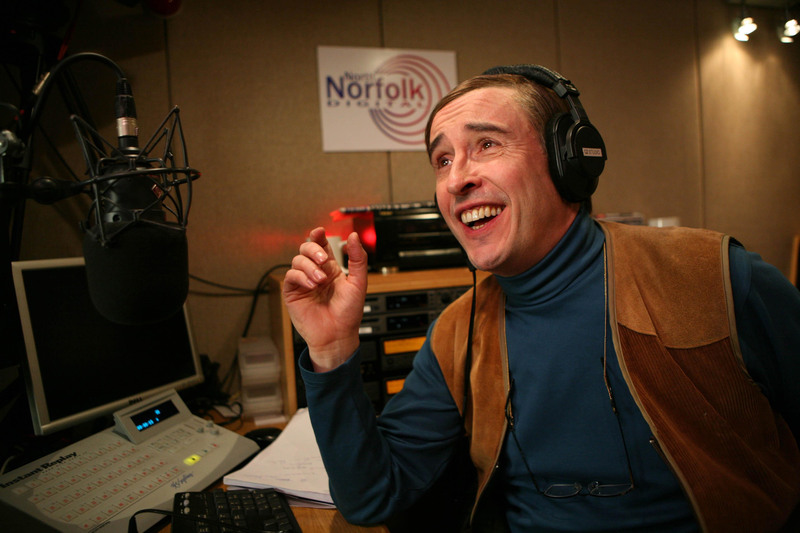 Slipping in under the radar of ‘the powers that be’, MMM sees Partridge dip a toe into the uncharted oceans of the World Wide Web via a webcam stream of his radio show from inside a North Norfolk Digital studio. This deluded ambition is played with to great effect, such as when Alan, panting on an in-studio exercise bike, explains what cycling is “for any viewers from a Third World country”. MMM clearly owes a debt to the success of The Ricky Gervais Show and takes a similarly alternative approach to comedy with its chat and banter based humour, which is often hilariously parodied through Partridge‘s self-conscious attempts to move with the times. After Alan and Simon exchange a string of laddish quips, a giddy Alan exclaims “this is great banter. It really is.” The range of phone-in topics, true to form, are brilliantly idiotic- “if you could make one species of animal extinct, which would it be and how would you do it?” or “forced celebrity breeding- if you could take two famous people and force them to mate, who would it be and why?” And sounding a softer note, there’s even a surprisingly touching romantic interest for Alan, bringing about his most revealing character development yet. All in all, MMM is a behind-the-scenes peek at one of comedies most disgustingly funny characters in his natural habitat and a giggle goldmine for both veteran Alanites and voyeuristically inclined newbies alike.